According to Corella, “This program brings together classical scores as well as modern touches. These ballets showcase how our artists’ technical abilities can be used to create emotional and moving performances for our audience. Neenan will debut his latest world premiere, which takes audiences into the mind of a performer, experiencing the emotional tolls they face on and off the stage, and the memories that they have made throughout their career. With an orchestral score composed by Troy Herion, the piece is an intimate glimpse into the mind of a dancer. “I’ve called it ‘Archiva,’ which is the Latin term for archives,” said Neenan, during a phone interview Tuesday evening. “The piece is about memory — about going into the past of a performing career or dreams of their career. “There is no set for the stage at the Academy. The stage is the set and the costumes are from the archives of the Pennsylvania Ballet — tutus and practice clothes. Some of the dancers’ costumes do change throughout the piece. The lead female dancer starts with a tutu that’s not buttoned in the back and her hair is down. By the end, all the dancers are in classical attire. “Amy (Aldridge) is the main principal. There are 19 dancers including seven principals. And, there is an ensemble — but the ensemble does a lot too. I was able to do workshops with the principals in November. I just wanted to get some of my ideas out. Then, we went on hiatus after ‘The Nutcracker.’ We got back in during the first week in April. This piece is set to an original score by Troy Herion. In the final piece, the Pennsylvania Ballet performs the North American Premiere of Liam Scarlett’s “Asphodel Meadows,” which was created for The Royal Ballet in 2010. The music for this ballet, Poulenc’s “Concerto for Two Pianos in D Minor” features a dialogue between the two pianos, which is mirrored in the compelling series of pas de deux performed by three principal couples. 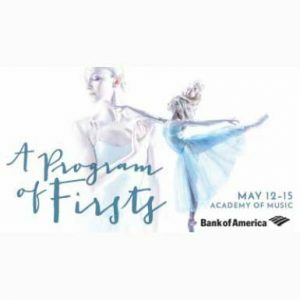 The performances at The Academy of Music are May 12 at 7:30 p.m., May 13 at 7:30 p.m., May 14 at 2 and 8 p.m., and May 15 at 2 p.m. Ticket prices range from $30-$135. There are millions of Elvis Presley fans around the world and thousands of Elvis impersonators and/or tribute bands. Most of the tribute acts try to look and sound like Elvis — and most focus on the later eras in Elvis’ storied career. Usually, the focus is not centered on recreating the music made by Elvis and his musicians — especially the music from early in the King’s career. Fortunately for fans who like Elvis for his music and rather than his looks, his film roles and has costumes, there is a band called Rex & The Rockabilly Kings — a band formed by renowned folk-rock artist Rex Fowler of Aztec Two-Step. On May 13, Fowler will take the stage at the Steel City Coffee House (203 Bridge Street, Phoenixville, 610-933-4043, www.steelcitycoffeehouse.com) with The Rockabilly Kings to perform authentic renditions of Elvis’ Sun sessions and early RCA Records classics. The music covers the period from 1954 into the early 1960’s. 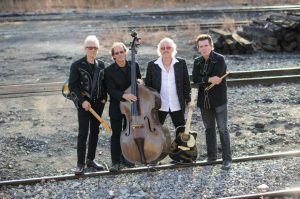 Fowler leads the band on Elvis-style acoustic guitar, lead vocals and riveting song introductions, and is backed by a virtuoso three-piece rockabilly band — Billy Rousde, Steven “Muddy” Rouse and Joe Geary. Billy Rouse plays Scotty Moore-style electric guitar and lead vocals and his brother Steven Rouse plays Bill Black-style standup bass, blues harp and lead vocals. Geary plays D.J. Fontana-style drums and hand percussion. The Rouse brothers also provide stirring Jordanaires-like backing harmonies that were a trademark of Elvis’ sound early in his career. Presley’s musical contribution, cultural impact, and artistic achievement made him an unsurpassed 20th-century icon. Drawing from his country and gospel roots, and the rhythm and blues of the fertile Mississippi Delta, Elvis intuitively created a revolutionary groundbreaking sound that previously had never even been imagined. These songs inspired John Lennon and Keith Richards (and many others), changing popular music forever. “The music we play is from Elvis earlier recordings — from the Sun sessions to the early RCA days,” said Fowler.”That’s when he was the most influential person on the air. It’s also what got lost when he went to Vegas with his jumpsuits. There are no jumpsuits, sideburns or sequins when Rex & The Rockabilly Kings are on stage — just good, authentic Elvis music. “We formed about a year ago,” said Fowler. “Our first show was January 8, 2015. I lived in Piermont, New York and these are local guys from Rockland County. They live and breathe rockabilly. They’re great singers — and they love Elvis Presley. Video link for Rex & The Rockabilly Kings — https://youtu.be/2r2niy-106o. The show at Steel City will start at 8 p.m. Tickets are 20 advance and $22 day of show. Other upcoming shows at Steel City are Nick Cianci and Eric Sommer with Kate Yeager on May 12 and Tin Bird Choir & Friends on May 14. If the New York band Leapling stayed true to its name, it would only get together to record and perform every four years. Fortunately, it operates on a normal cycle. 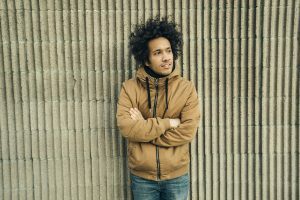 Leapling, which will perform on May 13 at Ortlieb’s (847 North Third Street, Philadelphia, 267- 324-3348, www.ticketfly.com), is the brainchild of Brooklyn-based songwriter Dan Arnes. “The first EP was ‘Losing Faith’ in 2013 and then ‘Vacant Page’ came last year,” said Arnes, during a phone interview Tuesday afternoon from his home in Brooklyn. I wrote it and demo’ed it myself. By then, I had formed the band and we started playing the songs live. “I made ‘Suspended Animation’ the same way — but with a different line-up than ‘Vacant Page.’ I made the new album quickly — three or four days at Sunset Park Studio in Brooklyn. Then, I added strings later. I had string arrangements on the demos and got friends to do them. How about that — Arnes really is a leapling. “You know what they say — with your first record, you have your whole life up to that point. The second record is usually a lot different. ‘Suspended Animation’ came along more naturally. “Tonally, ‘Vacant Page’ was very narrow — kind of bleak a lot of the time. It was a sound pattern that lent itself to a darker tone — slower with more restraint. The music on the new album is a lot more immediate and less concerned with restraints. Video link for Leapling — https://youtu.be/6eZ29qMozbw. The show at Ortlieb’s, which also features Beth Israel, is scheduled to begin at 8 p.m. Tickets are $8 in advance and $10 at the door. The Flash (102 Sycamore Alley, Kennett Square, 484-732-8295, http://www.kennettflash.org) will host Shytown on May 13, Rust – A Tribute to Neil Young on May 14, Open Mic with guest host Angelee on May 15 and District 97 and Valdez (members of Tinyfish, echolyn & Cold Blue Electric) on May 18. The Colonial Theatre (Bridge Street, Phoenixville, 610- 917-1228, www.thecolonialtheatre.com) will present a concert with British rock legends The Zombies on May 15. The upcoming shows at Chaplin’s (66 North Main Street, Spring City, 610-792-4110, http://chaplinslive.com) will feature Cook Bag, Aim 4 Grey, and Roll on May 13, Randy Sarles on May 14 and Awakening Mercury, No/Hugs and Sonnder Maitland on May 15. The Ardmore Music Hall (23 East Lancaster Avenue, Ardmore, 610-649-8389, www.ardmoremusic.com) will host Graham Parker on May 13, Tommy Conwell & The Young Rumblers and Stolen Rhodes on May 14. Doc Watson’s Public House (150 North Pottstown Pike, Exton, 610-524-2424, docwatsonspublichouse.com) will present Flip Side on May 13. Burlap & Bean Coffeehouse (204 South Newtown Street Road, Newtown Square, 484-427-4547, www.burlapandbean.com) will present Sarah Peacock and Flagship Romance on May 13, and Antje Duvekot and Michael Braunfeld on May 14.